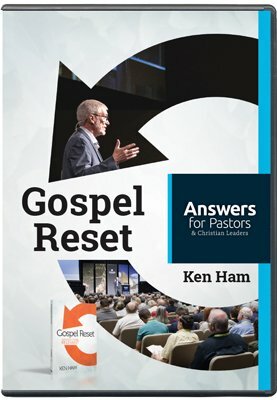 During our Answers for Pastors and Christian Leaders conference in the fall of 2018, I gave a presentation based on my book Gospel Reset, which was videotaped. This book and the new DVD of the talk dive into how to share the gospel in our increasingly secularized age. You see, the gospel message hasn’t changed (it never does), but the method by which we present the gospel message is going to vary depending on the culture and the context. Are you equipped to effectively share the gospel in today’s world? During this presentation, I share what’s happened in our culture to create the growing secularization, how we need to lay the foundation of the truth of God’s Word for others, and how we can move from that into presenting the gospel message beginning in Genesis. We want people to know that the Bible is true and therefore the message of the gospel that comes from the Bible is also true! The book and DVD are great resources to purchase together and are available separately or as a pack. Many of my presentations are available on PureFlix.com, the leading faith, and family-friendly streaming service. Our Answers in Genesis videos (about 500 videos!) are available on that platform, and we’re continually adding new ones as we produce them. Try a month of Pure Flix free at PureFlix.com/answers. And find Gospel Reset on DVD in our online store at AnswersBookstore.com.